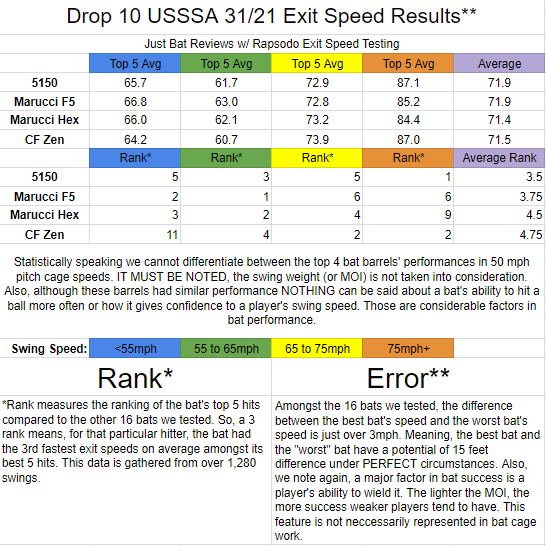 Exit speed testing and results have some SERIOUS issues and we ask you to consider them before running off to assume that exit speeds and the “best bat” are one and the same. Our biggest fear is we misrepresent what we are measuring—as exit speeds, on the surface, seem like a great litmus test for the best bat. Speed, ergo distance, is all that matters, right? Exit speeds for a given hitter in a cage are NOT the same as game exit speeds. 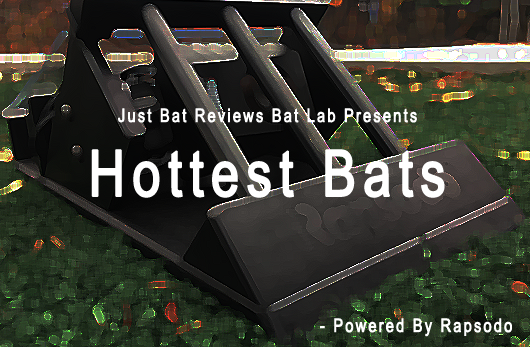 We want to be very clear, almost ridiculously so, before you speed off to click on the links below and buy some bats because Bat Digest said this bat was ‘hot’. We have learned much of these exit speed problems through trial and error. We know of no other source collecting, or at least publishing, its exit speed data. That leaves us in uncharted waters when finding how helpful the data may actually be. As a general rule, we have noticed, that stiffer bats with a heavier load balance tend to (but don’t always) perform better in cage exit speed tests than their two piece counterparts. We think in some measure, this phenomenon is a function of physics rather than actual game potential. Stiffer bats with a higher MOI transfer more energy, ergo speed/distance, to the ball and ultimately hit the ball farther. But what about bat speed? Doesn’t the higher MOI (swing weight) hurt bat speed and therefore affect ball exit speed on these heavy single piece aluminum bats? Yes! BUT, in cage tests where the hitters get all the time in the world to time up the same pitch over and over, we find that bat speeds don’t change very much despite a change in the MOI. This is the fundamental bias created by cage testing bats. Further, due to the fact that companies don’t make bats based on a swing weight, but instead, a length and weight, we don’t control for swing weight. Instead, we measure the 33/30 BBCORs, for example, against each other. As we discuss elsewhere, swing weight is vital in terms of measuring ball exit speed. It is therefore no surprise to find that bats with higher MOI’s tend to do better in our tests. So, we are left to collect data that does NOT account for the ability a lighter swinging bat gives a player at the plate in a game. Nor do we account for the confidence two-piece, sting free bats give younger players at the game plate. In short, we feel the exit speed data from the cage work we collect overstates the game ability of single piece bats (especially in younger players). There are serious concerns with testing exit speeds, and if you want to be an informed consumer, then you must understand them before proceeding to the test results below. Here are two of the major concerns that should be enough to give you at least some pause. We use the same size bats in our test (31/21 USSSA bats and 33/30 BBCOR, for example), but we don’t control for actual swing weight. Swing weight, you will recall, is different than stated weight, has more to do with the distribution of the weight in the bats than the total weight, and is the driving force in actual collision potential of a bat. So, in other words, the actual thing that determines the mass of the bat at impact HAS NO BEARING in the tests below. This leaves the results lacking, at best, in a significant piece of scientific validity. Why not control for swing weight? In short, because we can’t. There are no industry requirements as to the exact specifications of swing weight (within a range). We can’t just order up the old 4,132 MOI CF Zen and the 4,132 MOI Rawlings VELO. It is not how it works. All we can do is order a length and then compare it across the board—it turns out most of the bats don’t weight what they say they do anyway. The idea of a vacuum is a scientific principle where all things are constant except the variable being measured. For our tests below, we attempt to recreate the same scenario over and over while only changing one thing: the bat. To date we have captured the swing data on close to 3,000 different hits with 60 different bats. We do a decent job of controlling for the things we can. The pitch speed, ball type, hitter, elevation, humidity, recording device all stay constant. But, we have yet to invent (or buy) a hitting robot. That is, one that can recreate the same swing speed and bat attack angle with perfection regardless of the grip feel or predisposition to a bat. We do capture a lot of swings for each hitter, but at what number is a data set significant enough to drive reliable numbers? We don’t know—and neither does anyone else. Expect our data to get better over the years, but this Rapsodo technology (and any ball flight data) is new enough that we just don’t know. As well, we do not, maybe to our detriment, de-identify the bats. And even if our hitters are pretty good at believing they are unbiased, we still don’t have a great feel for how much the hitter’s bias affects the data. There is a good chance our hitter’s bias comes through with the bats regardless of our ability to control some of the variables that control ball flight. Is Exit Speed All that Matters? The ability of a barrel to produce the speed of a batted ball is vital in a bat’s overall performance. Measuring the exit speed is the very definition of the bat’s pop, or as some say, how hot a bat is. We think a barrel’s ability to produce a fast flying ball is a significant consideration when paying real money for a bat. It may very well be the most important one. We offer this article in response to the many players and parents searching for the hottest bat or bat with most pop. Our data is independent of any manufacturer or vendor. However, we note, ball exit speed is not the only serious consideration before buying a bat. Enforced performance standards have narrowed the barrel performance gap insomuch that ball exit speeds, or barrel pop, has become less differentiating. Consider things like price, feel on mishits, durability, warranty, swing weight and a host of other bat features which play a significant part in finding the best bat for you. Just in the BBCOR space, we measured over 800 swings with 15 different 2018 BBCOR bats. Please note that a few bats were not used and we are still in process of adding those data points to the metrics. We used a 33/30 in each model. We found the Rawlings Quatro as the clear winner in terms of ball exit speed. Not far behind the Quatro stood DeMarini’s Voodoo Insane. This two piece hybrid bat was hot from swing one, hit 19 of its 30 hardest hits above 80 miles per hour and was one of 6 bats to hit over 300 feet. Although it lacked the real top end speed of the Quatro or Voodoo Insane, the 618 Solo delivered the most consistent result. No bat, within its best 30 hits, hit more balls above 80 mph than the 618 Solo. It was the most consistently high performing bat of the bunch. A few USABats were difficult to acquire this early in the bat standard’s lifespan. Our intent is to add them to the lists below when we get our hands on them. Easton’s Beats X stood out as the clear favorite among the bat we tested for batted ball speed. It hit the ball over 60mph given our condition, 33% of the time. The 2nd best reached those speeds only 10% of the time. Note too, however, the bat’s swing weight was considerably heavier than any other USABat in the drop 10 space. Much more testing in this category will be required for more definitive numbers. We are particularly interested in measuring the change in the composite exit speeds as we work these bats in over the year. Although we did work them in with 250+ hits, many of the composite USABats failed to generate the ball speed of the aluminum. There were three winners in our 2018 exit speed testing for the USSSA 1.15 BPF 2 3/4 or 2 5/8 bats. The 2018 CF Zen, Marucci F5 and Rawlings 5150 took the top spots. Of note, each of these three bats could not have felt any different at contact. We used 4 different hitters with differing swing speeds to test the 16 different bats. We captured more than 1,200 swings of data and compiled them via our Rapsodo device. That data was them compiled in a spreadsheet and manipulated to find the data points we felt matterd. And, those where, how the bats performed at their peak performance after 30+ hits from each player. We took the best 5 hits, removing any outliers for data capture error, and got our final results. We discuss the hesitations on the data below, but before we rain on this parade, let us point out how unique an experience it is to accumulate real ball flight data by bat. Below marks the first time in the history of the sport, as far as we can tell, that game type ball exit speeds are available to the public in some form of statistical significance. No longer are we stuck listening to some self proclaimed bat expert telling us such and such a bat is or is not exceptional. Real ball exit speed data finally gives us consumers a chance to wade through the minutia of industry hype, vendor bias and fluff pieces trying to get your clicks and dollars and find conclusive data. It is tempting to take the ball flight data points we have gathered, in particular ball exit speed and flight distance, and assume they are the end all be all of deciding what bat is best. 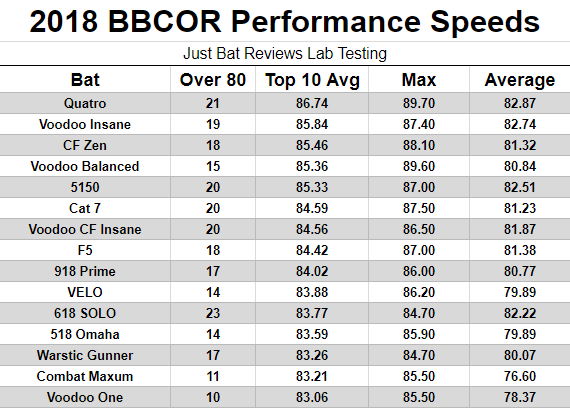 But, we emphatically note, while exit speeds and average distances are overwhelmingly useful in evaluating bat performance in a lab, they are far from the final say on the best bat for any given player. There are at least a few reasons why. Let us discuss two of them. The variables that determine the distance a ball travels, or the speed it comes off a bat are just that—variables. And although we are capable of controlling many of those variables in a particular Just Bat Reviews hitting session while gathering results for our database, we are not capable of recreating those variables under the conditions in which you are hitting. It is therefore possible, some might even argue likely, the results we gather are not necessarily repeatable under your circumstances. And, if they are not repeatable, they are not as useful. Take humidity, for example. The change in humidity has a proven affect on ball flight. Most of Just Bat Reviews’ tests are done at altitude in a dry state. It is therefore reasonable that a sea level player with considerable humidity might experience a different result. By how much and how consistently across each bat? We simply can’t tell. Humidity is likely one of the more abstract variables we cannot hold constant environment to environment. Here is a simple list of a few more that are more concrete. None of these can we recreate across location or situation, and each of these have a serious affect on ball exit speed. Another reason we should all hesitate on this data is because of basic statistics. We have a background in statistics, so before we bore you to tears, let us simply point out that gaining statistically significant ball exit speed bandwidths is terribly difficult. In fact, adding two standard deviations to any mean we have achieved, even well beyond 30 hits, has rarely put us close to any serious claim with serious confidence. Said more simply, means and averages might be an interesting thing to study and put in some ball exit speed table, but the variability in a real hitter hitting real pitches is so great that it is very difficult to prove that one bat is actually better than another with much confidence. It could be one bat is better than another simply due to chance. We try and control for this by getting a large sample size, but even then it is a difficult task. To determine the USSSA bat with the most pop we used 16 different 1.15 BPF bats from 2018 among four different hitters of varrying skill. We measured the ball exit speed on no less than 20 solid hits per player per bat. That works out to be 1,280 swings recorded. After capturing that data, we averaged the ball exit speed per bat, by player. Then, we averaged those player-bat averages by bat. Long story short, we came up with what we consider a very robust data set. It stands as the largest single study on bat performance in the USSSA ever performed for public consumption. In the end, we found DeMarini’s CF Zen to outperorm all other composite two piece bats. This was slighly surprising to us considering the bat is a tamped down version of the very hot 2017 CF Zen (that was deemed illegal by USSSA). Yet, despite that retooling, the Zen was the hottest of the bunch. Much to our surprise, the 2018 Marucci F5 was the bat with the fastest exit speed among all the drop 10’s we tested. This bat uses the same barrel as the 2017 Marucci CAT 7 but does not use the same technology in the knob to dampen sting. Our hitter with the best bat speed was most successful with the Marucci F5. This is no surprise as a single piece aluminum performs well with a stronger hitter. But, even our hitter with the slowest bat speed (sub 55mph) found the F5 as the 2nd best bat in terms of ball exit speed. 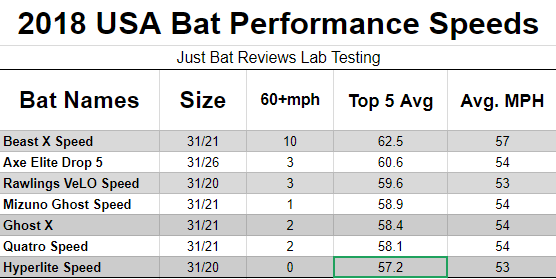 Hot out of the wrapper the 5150 performed as well as any bat we tested—actually better. The bat created some white knuckle experiences though as it rung our hands on more than one occasion and slowed down testing. But, in terms of barrel performance it did great—not surprising in our test that uses home run pitches and where bat dexterity is not a huge issue. As more USABats become available, we will update the following chart. We include the information for the seven we have tested, below. So far, the Easton Beast X Speed has shown considerable promise in the exit speed testing. It remains the only statistically significant (90% confidence) of being better than other bats on the list. Each of the below bats have been hit squarely 30 or more times. Many are drop 10 bats while others are drop 11’s. Note, too, there is a drop 5 Axe bat in the group. As we state in our hesitations above, bat speed is one of many factors we simply can’t control for in our testing. We find it interesting that the composite barrels on the USABat side are the ones that performed the worst. The aluminum the best. It is possible that USABats require much more working in than traditional USSSA or BBCOR bats. And, therefore, in time they will get as hot (or hotter) than their aluminum counterparts. We will keep updating this chart as we gather more data. Theoretically speaking, every mile an hour difference adds up to 5 feet of ball flight difference. If that data holds true, and our 2018 BBCOR performance spreads below are true, the difference between the best and worst 2018 BBCOR bat would be 15 feet on a perfectly hit ball. And although we would take the extra 15 feet any given day, we find it a surprisingly close spread considering the sheer breadth of BBCOR performance bats on the market. The below list contains the averages of no less than 30 squarely hit balls of data for each bat. The leaders, of which we have been enormously impressed, are the 2018 Rawlings Quatro and the DeMarini Voodoo Insane. You will notice from this list that several major BBCOR bats are missing. As we get them in house we will add to this list. But, in the end, we thought it robust enough to be worth publishing. To gather enough data to make determinations, we used the same hitter over multiple days. That hitter would rotate between each bat after either 3 or 5 hits recorded by the Rapsodo device. That data was captured via the Rapsodo app, transferred to an excel file and then manipulated to produce the tables above. We also removed hits that highlighted the player’s mishit more than the barrel’s performance. For example, a hit above a 40-degree trajectory was removed. As well, occasionally our hitter would miss one on the end cap and deliver a ball exit speed no where near what we know the bat is capable of at those bat and pitch speeds. We removed those from the data too. We sell the raw data on our raw data page. It is $10.